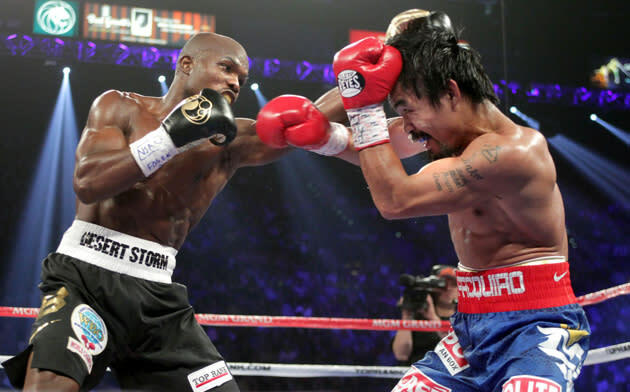 Five independent judges hired by the World Boxing Organization became the latest to conclude that Manny Pacquiao defeated Timothy Bradley when they fought for the welterweight title on June 9 in Las Vegas. WBO president Francisco "Paco" Valcarcel announced on June 13 he would have a panel of what he called "five international judges" review the scoring of the highly controversial bout. Bradley won a split decision and ended Pacquiao's seven-year winning streak in a result that outraged the sporting world. Even Senate Majority Leader Harry Reid (D-Nev.) said he thought Pacquiao won the fight. Judges Duane Ford and C.J. 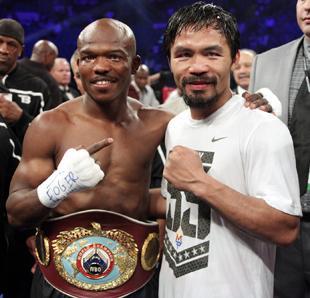 Ross each scored the bout 115-113 for Bradley, while Jerry Roth saw it 115-113 for Pacquiao. Ford, coincidentally, is a longtime close friend of Reid's. The outrage at the call was so great that less than 24 hours after the bout concluded, Top Rank promoter Bob Arum told Yahoo! Sports he would ask Nevada attorney general Catherine Cortez Masto to investigate the fight. Cortez Masto's office would not confirm nor deny whether an investigation is ongoing, but Arum told Yahoo! Sports on Wednesday that Cortez Masto's chief investigator and the deputy spoke to him in his Las Vegas office. "I told them they need to interrogate me, they need to interrogate Todd [duBoef, the Top Rank president] and all the people in my office," Arum said. "They have to ask hard questions." Arum wants the investigation because the public and many boxing websites have accused him of fixing the fight and having a hand in the judging. Ford told Yahoo! Sports on June 10 that he scored the fight as he saw it and said he felt Bradley gave Pacquiao "a boxing lesson" in the second half of the fight. Valcarcel would not identify the five judges he had review the tape of the fight, but he said they were well-known, respected officials. He said all five scored it for Pacquiao. One of the judges had it 118-110, or 10 rounds to two. Two of them had it 117-111 (the same that Yahoo! Sports scored it on fight night), one had it 116-112 and the other had it as Roth did, 115-113. Valcarcel kept a promise not to strip Bradley of the belt. He ordered a rematch, but there was a rematch clause in the contract and Pacquiao has said he wants to exercise it. Pacquiao will fight again on Nov. 10, whether it is against Bradley or someone else, Arum said. Upon hearing the news of the WBO's reviews, Pacquiao told reporters in the Philippines he was pleased and that he would defeat Bradley in a rematch to regain the title. "My supporters shouldn't worry. We're going to get that title," Pacquiao said. Arum, though, said he wouldn't agree to a rematch until he spoke with Pacquiao and explained the ramifications. He said he would ultimately honor Pacquiao's wishes, but said he thinks the attorney general needs to complete her investigation and show that there was no wrongdoing. "Obviously, he's the boss, he's the fighter, and to the extent possible, I'll do what he says," Arum said. "Otherwise, I wouldn't have his loyalty. I have to talk to him, though, and make certain he understands all the ramifications and if he is aware of what the public's perception is. I would have to have, if I were going to do a rematch, an investigation, which is ongoing with the attorney general's office, to clarify the situation. "If it was simply the incompetence of the judges and a simple mistake, period, which is what you and I suspect, and they determine there is no wrongdoing, that's easy to remedy. All we do is have a rematch with different judges. Absent that, given all this suspicion, no matter how unwarranted, it would be hard to do a rematch. Half of these websites are saying that the promoter is the one who did this and that I talked to these judges. I had nothing whatsoever to do with picking them and never talked to them." Arum said if he didn't make a rematch for Pacquiao with Bradley, he'd instead pair him for a fourth fight against Juan Manuel Marquez. He also said he is open to a Nov. 10 fight with Floyd Mayweather Jr., who is currently serving an 87-day jail sentence at the Clark County, Nev., Detention Center, "if we could work that out." But Arum said the biggest issue is the need for the Nevada Athletic Commission to pick judges from around the country and around the world for major fights, not just from Nevada. He said he felt that age was impacting the performance of both Roth, 71, and Ford, 74. Arum is 81. "Of course age is a factor in performance and Exhibit A is myself," he said. "I know that at my age, I can't concentrate as well as I did when I was younger. Watching a fight, 12-round fight, and concentrating over three minutes for 12 rounds really is an exhausting experience, if you're really looking to do it right. "I don't think any people past a certain age are able to do that, and I mean nothing against them. I'm not able to do that. I know boxing, but if someone said, 'OK Bob, you sit here and judge the fight,' I couldn't trust myself to concentrate that hard for that long."